Parkers’ Crossing Cabin is named for the Parker family that settled here circa 1920. Mrs. Parker’s maiden name was also Parker (no, they were not cousins); thus the name Parkers’ Crossing, honoring both families. The cabin offers private accommodations with two queen beds, one in a private bedroom and one in a loft, a one-of-a-kind, custom rain shower, and beautiful view of the natural setting that is unique to Holly Hill. 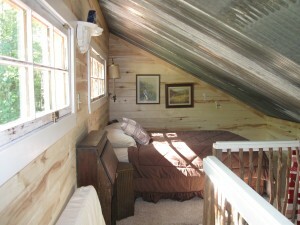 If you are lucky, you’ll get to sleep to the soft, soothing sound of rain on the tin roof. In drier weather you can warm your feet, and toast marshmallows at your own private outdoor fire pit, or just relax on the porch and enjoy the quiet solitude of country life. 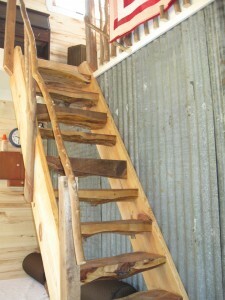 Parker’s Crossing Cabin is a companion property to Holly Hill Homestead Bed & Breakfast. Famous for its 30-year herb and perennial gardens, Holly Hill is known by its regular guests for comfortable, relaxing accommodations, customized breakfasts and personal attention. The entire property is a secluded, rural getaway in the piney woods of east Texas with nearly two acres of display gardens and over one-half mile of deep-woods walking trails. The property is popular among butterfly and bird watchers. Children love the farm animals, children’s garden and variety of wildlife. We purchased Holly Hill in 2001 from the Parker’s granddaughter, Kathryn Callaway, who had rebuilt the old house in 1978. She and her husband Jack made the creation of Holly Hill their retirement home. Kathryn is now 92, lives nearby and visits often. She grew up wandering these woods with her grandmother and tells interesting tales of experiences on this land from childhood through life and into old age. If you see a sweet little old lady in a hat, that would be Kathryn. Enhance your stay at Holly Hill Homestead with a pre-arranged workshop in herb gardening, cooking, decorating, design or other custom craft by request. Private dinners, luncheons and picnic baskets are also available with advanced notice. 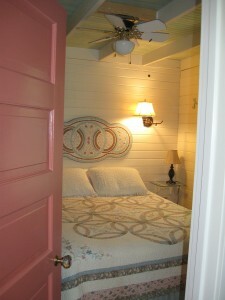 We invite you to stay the night, or reserve an extended stay in our beautiful, cottage-style cabin in the woods.